The Minicom by Tripplite Smart 108 IP 0SU70032 is an 8 port single user digital KVM switch which gives a system administrator secure, BIOS level access and control to a rack of up to 8 servers either remotely or locally. 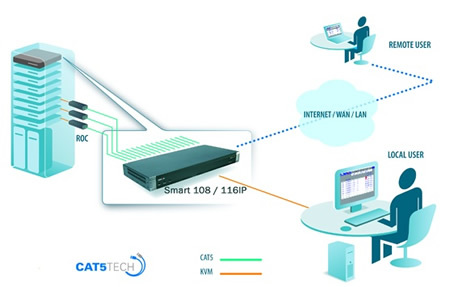 The rack mountable, 1U sized IP KVM switch features innovative ROC (RICC on Cable) dongle technology that directly connects the Smart 108 IP to each server in the rack, eliminating cable clutter and providing 30m/100ft of range between the server and switch. For bigger applications such as globally distributed servers or data centers, Smart 116 IP can be managed seamlessly under Minicom by Tripplite's KVM.net centralized management system. The Smart 108 IP supports the highest security standards for encryption (256-bit AES and HTTPS) and authentication of remote users. This IP KVM switch offers the option of exclusive mode, where users can choose not to share sessions with any other users. Administrators can configure user access rights, with advanced OSD management that has multi-layer security for both local and remote users. ROC dongles are necessary and proprietary to connect this switch to your server/computer and has the option of PS2 or USB connections. Accessories such as ROC dongles are not included but may be purchased separately. Question: Is there a minicom/tripplite model that provides USB connections instead of PS2 for the console port?